The China Harbor restaurant - a decent bite to eat, but a good view. 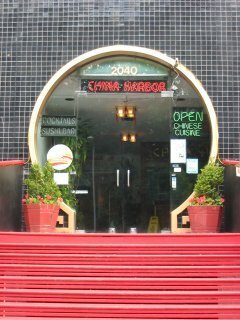 Ever been to the China Harbor restaurant? If you haven't been to the China Harbor restaurant, it's a place worth going to if you want a nice view of Lake Union. The last time we were in Seattle, I was over in the Fremont district quite a lot and one day, a friend of mine who lives there in Seattle wanted to take me to a Chinese restaurant he knew about. 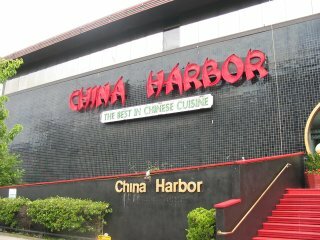 We ended up going to China Harbor which was just across the Fremont Bridge on a marina. He had been there a few times and while he said the food wasn't the best he's ever had, the view of Lake Union made up for the lack of tastiness. First of all, the building is huge! It must be three stories tall, but the restaurant portion is on the second level. A lot of times the restaurant is rented out for banquets or ceremonies (there's a dance floor/room off to one side of the restaurant specifically for this purpose). We ended up going there two or three times and each time we went there was hardly anyone in the restaurant. I don't know if it was because the food wasn't that good or because we went on off days, but the good thing about that was that we were able to request a seat right next to the window. There are windows all around the restaurant and because the restaurant literally sits on the shores of Lake Union, you can get a really nice view. I talked to the owner the last time I was there and from what I gathered, the China Harbor restaurant has been around for a pretty long time and it'll probably be around for a long time since it sits on some pretty nice real estate. So while the Chinese food isn't the best I've ever had, it is decent enough that if you're in the neighborhood and feel like eating some Chinese food while enjoying a great view, it'll do. The address is 2040 Westlake Ave N. in Seattle. Back from the China Harbor restaurant.